We returned home Friday after driving 16 hours both ways to see Rush in Colorado. We spread the drives out over two days each time, staying over at the posh Amarillo La Quinta, home of musty air conditioning and pet droppings in the grassy patches. The long drives and seedy motel stays were worth it since we got to see Rush in what's probably one of the best venues in North America, Red Rocks in Colorado. Built out of a natural amphitheatre in the mountains outside of Denver, Red Rocks is a mixture of natural beauty with a man made venue overlaying it in seamless fashion. The staggered stadium style seating means that everyone in the place has an unobstructed view of the stage, a rarity for most concert venues. The weather was mild and beautiful, and the crowd were fully energized for a night of classic progressive rock from its pre-eminent power trio. The set list didn't disappoint with their typical mixture of old and new (including two songs from their forthcoming album) with the classic "Moving Pictures" being the feature of their second set. "The Camera Eye" is a song I never expected to see Rush perform, and it was a truly moving experience to hear it live for the first time. The show featured all the requisite Rush lights, video, sound, pyrotechnics, with a set list to satisfy everyone who came to the show. They played all the expected hits but threw in enough deep cuts to satisify their stalwart loyal. In addition to TCE, they played La Villa Strangiato, Leave That Thing Alone, Stick It Out, Presto, Faithless, and several other deep cuts. Their two new songs "Caravan" and "BU2B" were ideally suited to live performance since both are pretty hard rocking tunes. A fantastic show as always and we're looking forward to seeing them again in Houston next month. but declines to throw it. Reports were widespread that an ultimatum from Jimmy Page and John Paul Jones had resulted in Robert Plant relenting and agreeing to tour with Led Zeppelin next year. I bought it enough to tell my wife to plan for a trip or two and a new bank loan to pay for the tickets next year. Today I wake up to see a report that Robert Plant posted an announcement on his web page that he will not be touring, but wishes the other members well in their future endeavors. The rumors were that the band was auditioning another, younger singer to take Plant's place and that this is what motivated him to relent. Apparently, it isn't to be. If Zeppelin does tour with a different singer, I'll probably still go see them. After all, it will still be Jimmy Page and John Paul Jones with John Bonham's son and they will play a pretty solid setlist if they repeat what they performed at the O2 show. I have to wonder if Plant or other parties will sue the band if they try to tour under the Zeppelin name. Whatever they call it, I'll still be motivated to see them. I last saw Jimmy Page when he was with the Firm in 84-85. I saw them before they had a name at the British Invasion tour show in Dallas, and then again a year later as the Firm. It was a decent show, but not Zeppelin. Jimmy did play a very drunken instrumental version of Stairway at the first show and I was close enough to jump up and touch his doubleneck (his guitar, you pervs) although I also declined. Paul Rodgers is good with Bad Company, and I really like what he has done with Queen but he didn't really gel with Jimmy Page back then. I'll be very happy if they can get someone with Robert's old vocal range and play the songs like they were played back in Zeppelin's heyday. I just saw on the news that Richard Wright, keyboardist of Pink Floyd has passed away from cancer at the age of 65. Richard Wright was often overlooked but a critical member of the band whose input was important on all the landmark Pink Floyd albums. Lately he had been a prominent member of David Gilmour's band and touring group and was featured prominently on the video for the "On an Island" tour. The chance for a real Pink Floyd reunion is now permanently gone, although it was very unlikely with Gilmour's motivation to reunite. Richard Wright will be missed. Unfortunately for many Rush fans in Houston and New Orleans, the shows got swapped to make way for the NBA playoffs which means Rush is playing Houston on Saturday the 19th instead of Sunday the 20th and there a lot of people trying to get rid of tickets they can't use now. On that note, I saw a deal on some Houston tickets for about half what they were going for before the date change. This is still a markup from box office, but it's so much cheaper than it would have been, and now with the show on a Saturday instead of a Sunday, the opportunity was too good to pass up. So we're now going to see Rush in Houston in two days (11th row on Geddy's side) followed by the Austin show on Wednesday night. Fan-frickin-tabulous if you ask me. And you did, you did. For months I have been saying that I would be cutting back on my concerts with an extended vacation coming up and some inflationary belt tightening. However, the day is drawing close when Rush will be playing Austin on the 2nd leg of their Snakes & Arrows tour. A few days ago I was sitting in my office thinking about the upcoming concert and realizing I would be one hour's drive away from a Rush concert and I was missing it to sit at home and watch TV or something else extremely worthwhile. I knew that wouldn't work, especially since I'll have no chance at seeing shows for 12 months (e.g. Yes in August). We're not quite as close as the last show, but this time we're in the middle front floor section and being on the 11th row will probably mean a better sound mix. It just seems like he isn't ever going to change his mind. Hopefully a DVD will be released of the show. Highlights for this year were seeing Metheny again (I had seen him in 84 with the group and on New Years Eve 85 with Ornette Coleman but have since lost the stubs), seeing Michael Hedges twice, and seeing Rush in a better concert environment (Reunion Arena vrs the Cotton Bowl) for their Power Windows tour. PIL and Big Audio Dynamite were a blast, and I enjoyed all the Bronco Bowl shows. REM was a bit of a snoozer and Michael Stipe was in full prick mode. He was unhappy about some fans getting a little rowdy in the front and said something like "you guys are going to calm down or I'm stopping this show right now". A bit full of himself to say the least. 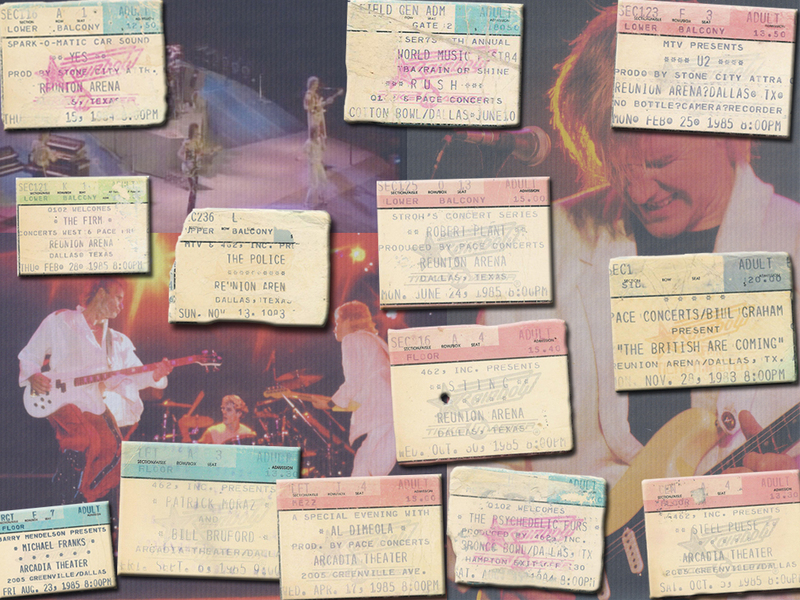 After posting the tokalicious (that's a medical term, don't trouble yourself…) Rush stubs, I realized I had kept most of my concert stubs over the years and they were just languishing in a dark box for none to grow envious of see. 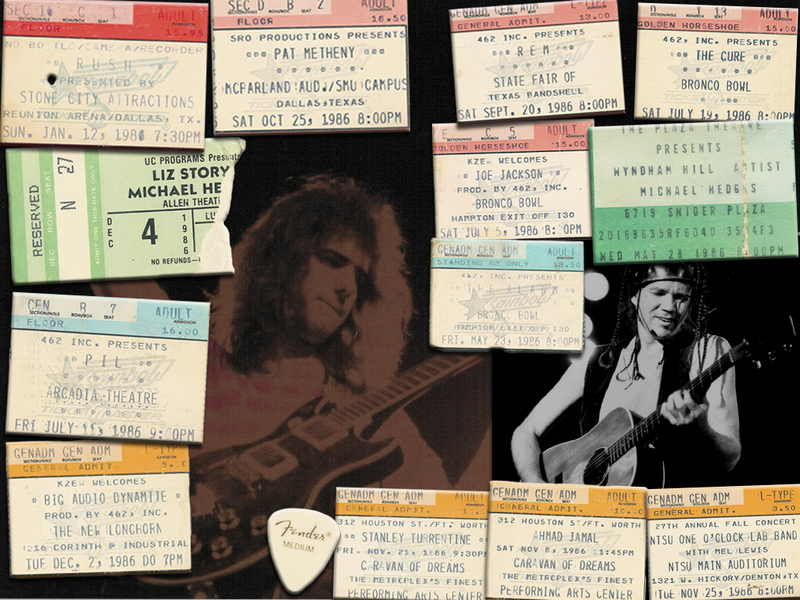 I decided to give them a little photoshopin' (worthy of the arts & crafts club if I do say so) so here is the first collection of stubs from the 1983-85 tour seasons. I must add that I have unfortunately lost a few of my ticket stubs over the years (most notably from this time frame would be Van Halen on the Diver Down tour with Dave instead of the Samster). Nevertheless, most of the most notable shows I saw in those years are on display here. Please share your concert photos, ticket stubs and hemp clouded memories from back then if you care to.